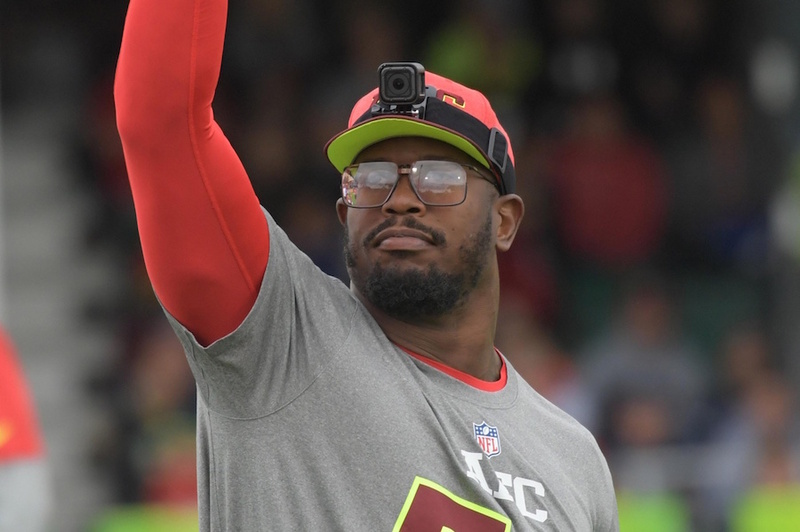 All-Pro linebacker Von Miller is at his best on the football field when he can play fast and relaxed. His biggest moments come when his team is in the league and he can rush the quarterback unencumbered. That same trait is true when Miller is in front of the camera, as we saw in the debut episode of “Von Miller’s Studio 58” on Facebook Watch. Just like he is on the football field, Miller is at his best in the show when he’s relaxed and playing naturally. The show opens a little slowly (after a mature content warning for profanity and crude language — parents, you’ve been warned), with Miller telling us he’s live from the Super Bowl even though it appears the show was filmed previously. Miller’s delivery in the opening sequence feels a bit rehearsed, but the show quickly picks up steam after the opening credits. Miller and co-hosts Tony Jerod-Eddie and Cyrus Gray (DeSoto High School and Texas A&M pals described as “Von’s brothers,” although they are not in the biological sense) lock Vins Miller (his actual brother) out of the house in a “Vins on the Scene” bit where the trio grill Vins on what he’s seeing in the neighborhood. The scene wraps with some burp and fart jokes, which, let’s be honest, are always funny — especially when they’re coming from Von Miller. Next, Miller sat down with All-Pro cornerback Jalen Ramsey on location in Orlando during Pro Bowl week. (Miller was named the game’s Defensive MVP, in case you missed it.) Ramsey gives Miller some advice on trash talking and owns up to his claim that the Jaguars were going to beat the Patriots in this year’s AFC Championship. Miller is a natural interviewer, and it’s a fun and relaxed conversation — plus you get to see what Miller would look like as a barn owl. Speaking of animals, Miller and his co-hosts then embark on a trip to the Denver Zoo to help with some zookeeping duties in the elephant enclosure. Jerod-Eddie is a free agent NFL nose tackle and Miller has one of the most impressive physiques in football (last year he earned the nickname “quadzilla” for his massive quadriceps muscles), but they are nothing compared to “Groucho.” The largest animal in the zoo’s collection, Groucho proves to be a hilarious (and messy) comic foil to Miller and Co. as they help give the 11,000-pound animal a reproductive checkup — rectally. After Miller is done being shoulder-deep in Groucho’s nether regions, he introduces us to his new ride sharing service, “Vonner.” The best part of the commercial is the fanny pack. The show takes a “Magic School Bus” turn when Miller departs on his “kayak of exploration” inside an active volcano (don’t worry, it’s all done on a green screen — there is no risk Miller will be healing from possible lava burns this offseason). The DeSoto duo makes a special guest appearance inside the volcano, which leads to a trip inside a burrito. It’s cheesy (the bit and the burrito), but funny. Where they end up (no spoilers here) is pretty hilarious. After another minute or two with Ramsey, Miller then introduces viewers to the different residents of his exotic fish tank. Each one has a backstory, including one who blew a full-ride scholarship because of bad grades — so, stay in school kids (sorry, bad fish pun). The show wraps with a Q&A with Miller and the guys. It’s a little stiff, just like the open, and the bit runs on a little longer than necessary. Overall, it’s a solid first effort and has plenty of potential for future episodes. Most importantly, it will make you laugh.